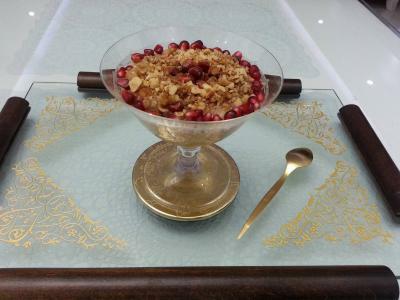 This is one of the oldest and most traditional desserts of the Turkish cuisine. The month following the Feast of Sacrifice is known as the Aşure month. Plenty of aşure is cooked in every household which is both served to the guests and distributed to the neighbours and relatives. The legend regarding the origins of aşure is as follows : "When the Flood finally subsided and the Noah's Arc settled on Mount Ararat, those on the vessel wanted to hold a celebration as an expression of the gratitude they felt towards God. But alas, the food stores of the ship were practically empty and so they made a soup with all the remaining ingredients they could find and thus ended up with the aşure". 1. Wash the wheat, chickpeas and dried beans. Soak them separately overnight with the beans and chickpeas in 1 cup and the dövme and rice mixture in 2 cups of water. 2. Add 3 cups of water to the dövme and 2 cups of water each to the chickpeas and beans and place them individually on the burner. Cook the dövme until the grains are dissolved and the starch comes out. If necessary boil the chickpeas in pressure cooker. 3. Wash the dried fruits and soak them for 2 hours in 1 ½ cups of water. 4. Mix the cooked ingredients together, then add the dried fruit in a pan and cook for 15 minutes. 5. Peel the orange and cut the rind, including the white inner part into 3-4 cm long and 1 cm wide strips. Divide the orange slices into 4-5 pieces. Add them altogether to the mixture and cook for another 5 minutes. 6. Add the sugar and cook for 1-2 minutes, then turn off the heat. Add the rosewater and stir. 7. Pour into dessert cups. Garnish with walnuts and the jewels of pomegranate fruit. The pudding can be enriched with almonds, hazelnuts and currants. In addition to dried white beans and chickpeas, dried broad beans and dried black-eyed beans can also be added. In some regions pomegranate molasses replaces sugar.